Premium body butter provides long-lasting hydration. In a clinical study on 30 women, who used the product once on their outer forearms, participants experienced an average 53% improvement in moisturization after 30 minutes. Apply to warm, damp skin. It can be used all over the body and is ideal for dry elbows, heels and knees. Alaria esculenta extract is a rich source of fatty acids and antioxidants. Ingredients: Aqua/Water/Eau, Cetearyl Alcohol, Prunus Amygdalus Dulcis (Sweet Almond) Oil, Glycerin, Dicaprylyl Carbonate, Helianthus Annuus (Sunflower) Seed Oil, Coco-Caprylate/Caprate, Dicaprylyl Ether, Squalane, Butyrospermum Parkii (Shea) Butter, Persea Gratissima (Avocado) Oil, Cetearyl Glucoside, Parfum/Fragrance, Alaria Esculenta Extract, Alcohol, Ascorbic Acid, Ascorbyl Palmitate, Benzyl Alcohol, Butylene Glycol, Caprylic/Capric Triglyceride, Ceteareth-33, Citric Acid, Imidazolidinyl Urea, Lactic Acid, PEG-8, PEG-40 Hydrogenated Castor Oil, Phenoxyethanol, Potassium Sorbate, Psidium Guajava Fruit Extract, Pyrus Cydonia Fruit Extract, Tocopherol, Vitis Vinifera (Grape) Seed Extract, Xanthan Gum, Yogurt Powder. I have very dry crepe skin particularly above knees/thighs. I have tried many moisturizer and this is the only one I found to have made the difference instead of dry rough almost scaly feel, my skin has changed to smooth and soft to touch. I haven't noticed a difference in the saggy skin YET. However I am hopeful with time there will be improvement. Could use a bigger tub. Wonderful firming body butter. It does not take much to apply twice a day for younger looking skin. Love the fragrance, too. 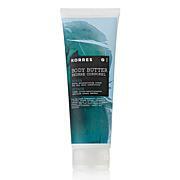 Korres is just beyond the Best products I have ever put on my Skin . I have the most sensitive skin & have break outs ,Excema & Contact Dermatitis from many High End products . Not Korres ! From the Shower gels to this Amazing Yoghurt Butter , My skin hasn't looked this good since my 30's . 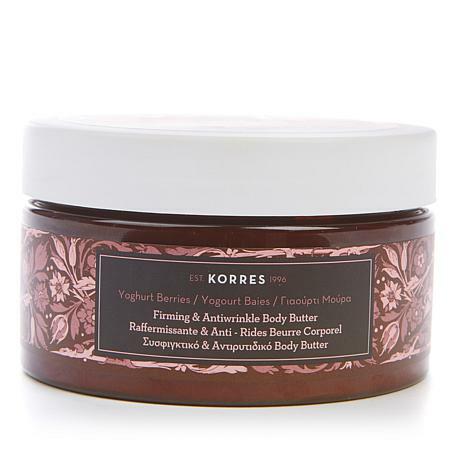 I Highly recommend Korres to All . This is an amazing body butter! My skin has never felt as smooth since starting this product. The smell is heavenly and lasts a long time! I'll keep using it to assess the anti-wrinkle properties. So far I'm loving this one! I have recently lost 40lbs and have some sagging. I have purchased so many things that supposedly going to take care of this problem. I noticed a big difference after the very first use. My arms actually looked go and I was able to wear a sleeveless top. I love it. Can't wait to try it on my legs.